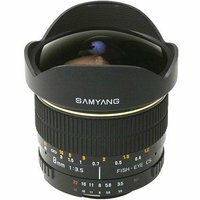 The Samyang 8mm f3.5 Aspherical IF MC Fisheye CS II lens is designed to work with cameras that have an APS-C sensor. The lens delivers a 180-degree field of view and is great for special effects use where distortion, exaggerated perspective and extreme depth of field are desired. The construction of the lens is based on 10 elements placed in 7 optical groups. The lens features a built-in lens hood which is designed to reduce flare to ensure maximum contrast and protect the lens from getting scratched. This lens is a manual focus lens and does not autofocus (AF).